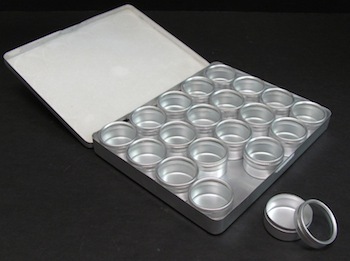 20 aluminum boxes with clear lids fit snugly into their aluminum carrying case. Each box measures 30 x 18mm and is perfect for storing your beads! Create a comfortable work space on any table or tray and prevent beads from rolling away! 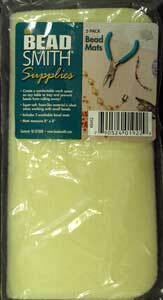 Super soft, foam-like material is ideal when working with small beads. Includes 2 washable bead mats. Catch those bouncing beads with a single touch. 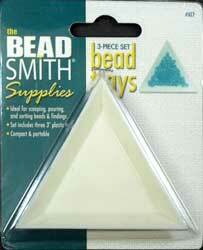 This great beading aid adjusts to any finger and holds beads for easy threading. It also helps to protect fingers from the sharp beading needles. how many beads do I need for my project? 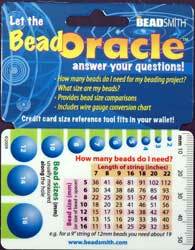 Let the Bead Oracle answer your questions! This handy credit-card-sized reference includes rulers in both inches and millimeters. There is also information about seed bead sizes as well as larger bead sizes in millimeters. Plus there is a reference for wire thickness in millimeters. It’s an excellent guide for the beader on the go! Perfect for use with a wide variety of beads. 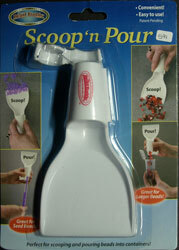 Includes 3 scoops, small (2 1/8" x 3/4"), medium (3" x 1") and large (4" x 1 3/8") Measurement size includes handle. Ideal for scooping, pouring, and sorting beads and findings. Set includes three 3" plastic trays. Compact and portable. Strengthen your thread and reduce knotting in handsewing. A must have for metal thread embroidery. Keeps small beads and findings from rolling away. Surface feels sticky but leaves NO residue! Rinse and dry Bead Mat to refresh sticky surface. 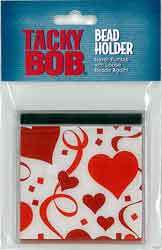 Tacky Bob Bead Holder - never fumble with loose beads again! The specially designed acid-free tacky lining, magnetic needle holder and non-skid bottom, you will never have to fumble with loose beads and needles again. Perfect for scooping up beads or other small items to pour into containers. Comes with a cap to close the funnel until ready to pour. Great for making jump rings, consistent loops and coils. Each tool is a carbon steel 5-stepped mandrel with a rubber handle and an overall length of about 5.5 inches. The smooth surface will not mar the wire. Diameter for the smaller mandrel steps are 1.5, 2, 3, 4, and 5mm. The larger mandrel steps are 6, 7, 8, 9, and 10mm. Also great for coiling DMC Memory Wire and Kreinik Hot Wire to be attached to needlepoint canvas designs. Use to form knots between beads or pearls. Fine point helps loosen knots. Comfortable ergonomic handle. Also great for widening holes of needlepoint canvas. Designed for use with your favorite flat back crystals up to size SS12. 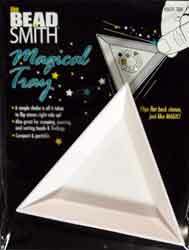 Shake the tray and the flat back crystals quickly and easily turn right side up. The tray’s textured surface design uses friction to flip the crystals just like magic. This set has one handle with four interchangeable mandrels, each having a different shape (circle, oval, square, or triangle). 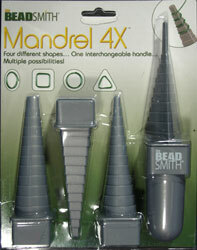 Use the Mandrel 4X to create uniquely shaped jump rings, toggles, pendants, earrings, and other jewelry items, as well as decorative home accent pieces and scrapbooking embellishments. Also great for coiling DMC Memory Wire and Kreinik Hot Wire to be attached to needlepoint canvas designs. The perfect tool for scooping and guiding small beads into storage containers. 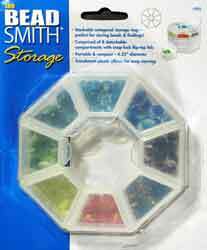 Stackable octagon storage ring - perfect for storing beads and findings. Comprised of 8 detachable compartments with snap-lock flip-top lids. Portable and compact. Translucent plastic allows for easy viewing. Stainless steel. 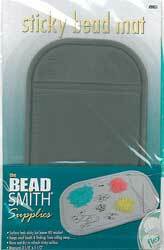 Ideal for tying and untying knots in beading cord. Expand loops or holes in charms to accommodate rivets. Enlarge openings in filigree to accommodate jump rings. Expand soldered chain links to accommodate jump rings. 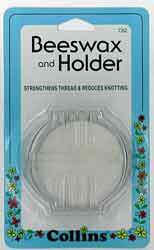 Also great for widening holes of needlepoint canvas.